On our way into and out of Rock Ridge, we walk along the edge of the northern section of Rock Lake, where it joins up with Lilypad Lake (both my names). In the centre of this area there’s a largeish bog, complete with Black Spruce and other more northern bog specialties. For the most part these species are contained along that edge. 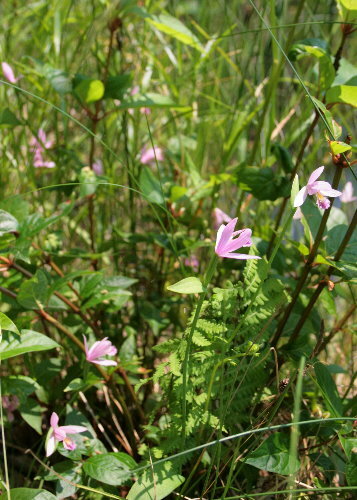 However, as we walked along the lake edge in the pre-dawn light we spotted a number of small pink flowers growing beside the water. On our way out we paused to take a closer look. They turned out to be orchids. 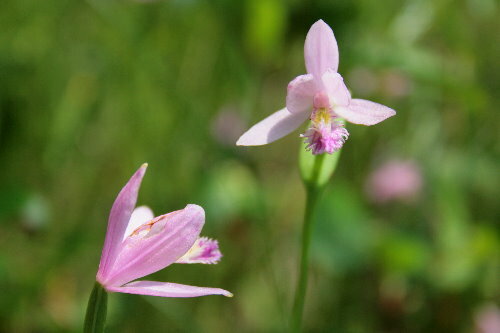 Known as Rose Pogonia (Pogonia ophioglossoides), also known as Snakemouth for its shape, this species is usually associated with bogs and boggy shores. It’s most often found growing in pockets of sphagnum moss, but I didn’t notice that to be the case with this group. They bloom for a few weeks from late June to mid-July, and are fairly common in appropriate habitat. How lovely they are! Orchids. YUM! Next Next post: Scheduled post: Moving day!